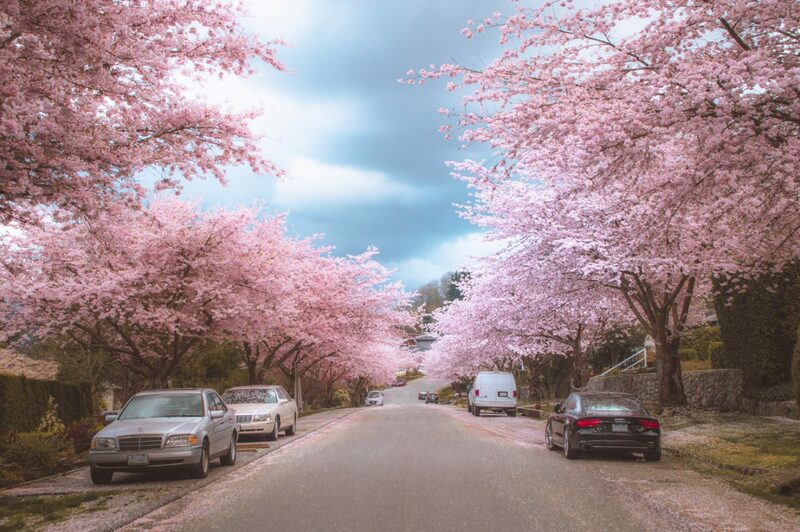 Cherry Blossoms in Vancouver 2019: Where to Take the Best Photos! ﻿ It’s the most grammable time of the year, folks. Finally, the incredible cherry blossoms in Vancouver have begun to bloom, adding pops of pink to dreary Greycouver. Of course (as you’d expect), your girl here is on the front lines of battle, clashing tripods and clamouring over street space with the city’s most aggressive iPad photographers. But I mean really, if taking a million identical cherry blossom photos is wrong, no part of me wants to be right. Plus, it seems like fate that I timed my visit home so perfectly to catch allll the blooms. So, if you’re keen to get ‘avocado toast level’ basic with me this Spring, here’s a guide on where to take the best cherry blossom photos in the Greater Vancouver Area. Apart from a small handful, I’ve tried to avoid residential streets because there are too many good ones (and photography there is hard with all the cars running you over and stuff). Anyways, juice up those memory cards, get those wistful stares ready and let’s go – we have some candids to fake. PS: This list is by no means exhaustive, and as I’m sure you know, cherry blossoms are fleeting (that’s kind of their whole “thing”) and cherry blossoms in Vancouver are no exception. I apologize in advance if some of these blooms are gone already, or if they don’t look as fluffy in the photos. I wish I could make them last forever! I’m basically outside every day though searching for more, so keep an eye out on my Instagram Stories. 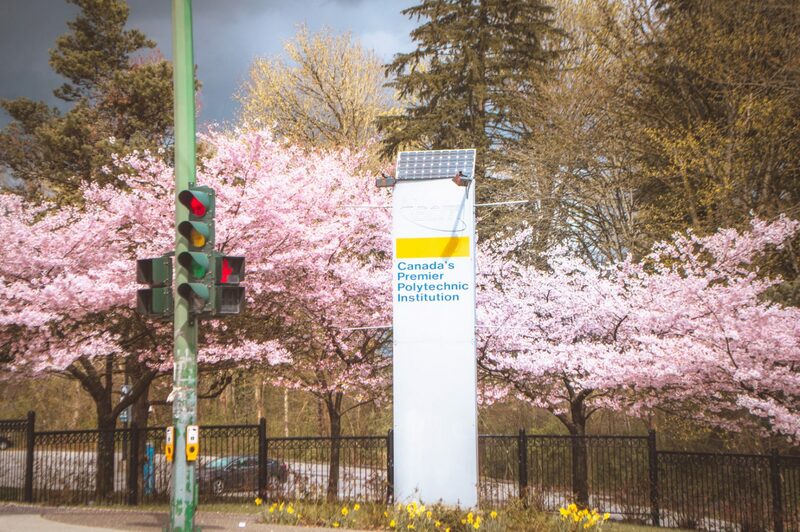 If Instagram is any indication, the section of Graveley St between Lillooet and Rupert is THE “it” spot for cherry blossoms in Vancouver this year. This two block stretch of blooms is gorgeously magical, with towering cherry trees creating a pink canopy overhead (and beautiful white blooms on the Rupert end). Remember though, this is literally just a residential street, so get out of the way when cars are trying to pass. The amount of people I witnessed almost getting run over made me embarrassed for humanity. Oh yes, and let’s not forget that people actually live here, so keep the excited hollers to a minimum. Ah Queen E Park – the city’s “go to” date place, prom pic place, wedding pic place, spy on doggos place, etc. etc. It’s a no brainer then that this park is also one of the best places to find cherry blossoms in Vancouver, and it’s taking its role veeery seriously. 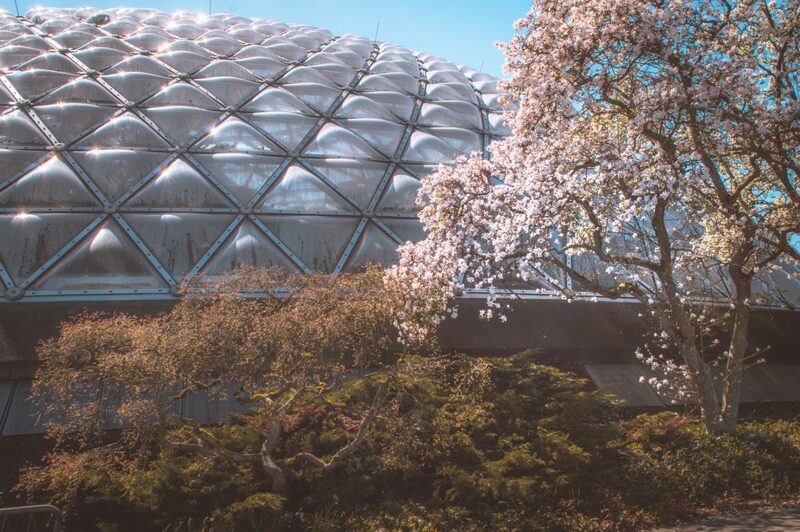 This year, Queen Elizabeth Park is also the site for many Vancouver Cherry Blossom Festival events, including a giant pop up picnic and Spring Lights – a once-a-year soiree where illuminations are projected directly on the blossoms. I don’t use this term often, but it’ll (actually) be lit. This little plaza in front of the Granville Square building is one of my favourite spots in the city. 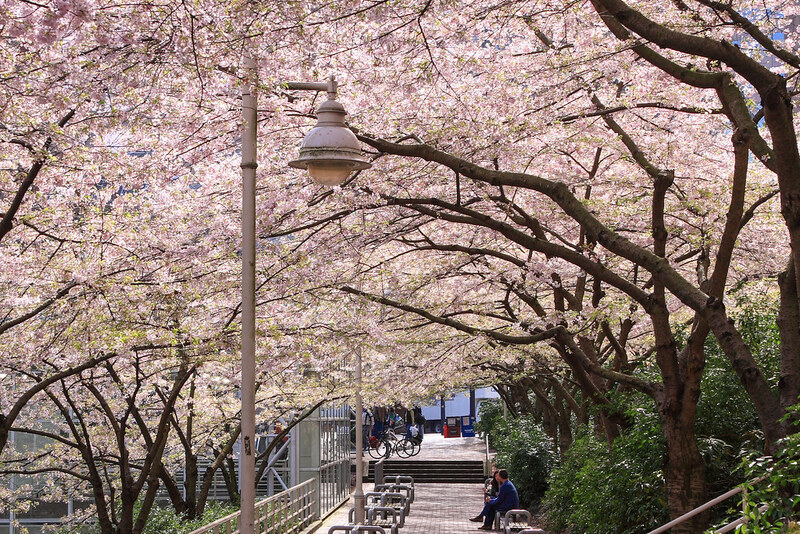 Located right by Waterfront Station, this is THE perfect place to scope out views of the iconic Canada Place sails and the sweeping North Shore mountains – all the better when the cherry blossoms bloom and add a pop of pastel pink to the scene. This is THE quintessential Vancouver snap, so get to it! 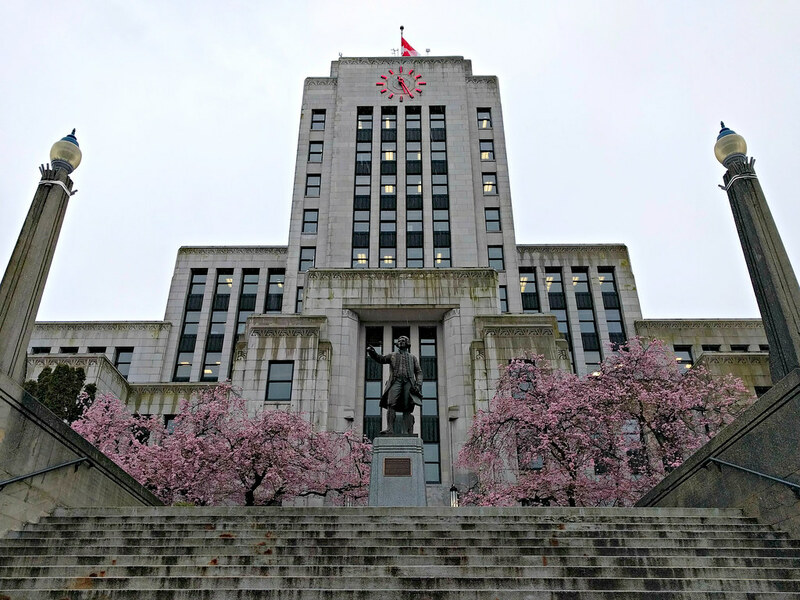 The pops of pink in front of the (ordinarily drab) Vancouver City Hall provides a refreshing sight for sore eyes. Maybe I just love the contrast, or maybe I love that my favourite tacos are nearby (shoutout to my La Taqueria homies) – either way, this spot takes a reaaaal pretty picture. Okay, so it’s technically Richmond, but how could I NOT include this place? 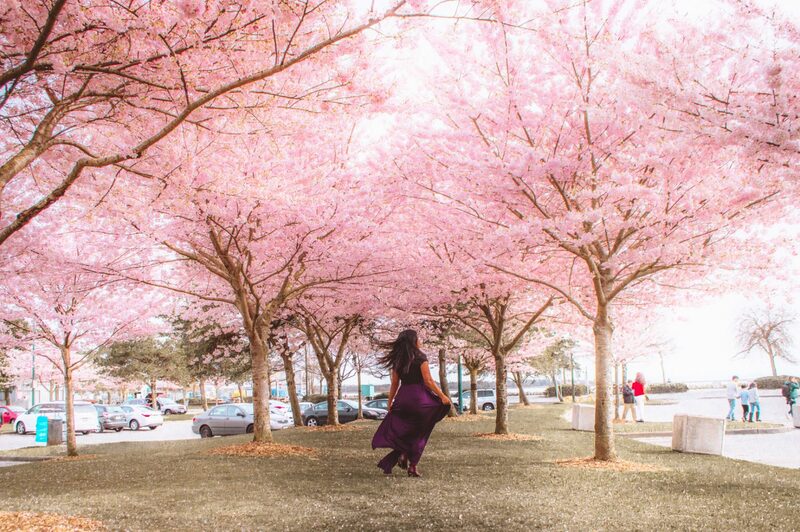 Garry Point Park is a scenic walk any time of year, but when the cherry blossoms explode, that is some next-level magic. You’ll feel like you’ve been transported to Japan for real. I even spotted a group of people in kimonos having an actual picnic (as in, they brought a table and decorations), so if you fear being judged for “extra-ness”, I think you’re safe here. I wish it was socially acceptable to make million word blog posts, because there are so many other incredible places for cherry blossoms in Vancouver (and the greater Vancouver area, really). Here is a short list of ones I couldn’t source photos for, or ones that haven’t bloomed yet (or were already gone) by the time I went. Keep these on your list though – they’re epic. West 22nd Ave (between Arbutus and Carnarvon): I’m devastated that I haven’t been to this spot yet, but the photos speak for themselves. Block after block of beautiful cherry blossoms, with some hills so you can get cool vantage points. The cherry on top of this photogenic cake is of course that you get great sunsets too! Stanley Park: One of the most beautiful places in Vancouver, and it only gets better in Spring! There’s quite a few cherry blossom trees scattered throughout the park, but the prime photo opp is along the seawall (where there’s a few sprinkled around). This allows you to get some of that classic “City of Glass” skyline in the shot 😉 Swoon. Burnaby Mountain Park: Not only does this park offer some of the best views in the Lower Mainland, the cluster of trees lining the path near Horizons restaurant is ridiculously pretty and picturesque. SFU students, come here for a brief respite from the terror of finals. This little park at Buchanan and Rosser: Super symmetrical and pleasing little square with rows of cherry blossoms. It’s right by Brentwood Mall, so easily accessible by Skytrain if you don’t mind a short walk. Last but not least, I have to say – honestly if you keep your eyes open, there are beautiful cherry blossoms to be found ALL over the city. Take some long scenic drives, keep your head up during Skytrain rides and *gulp* maybe even go for a walk or something? 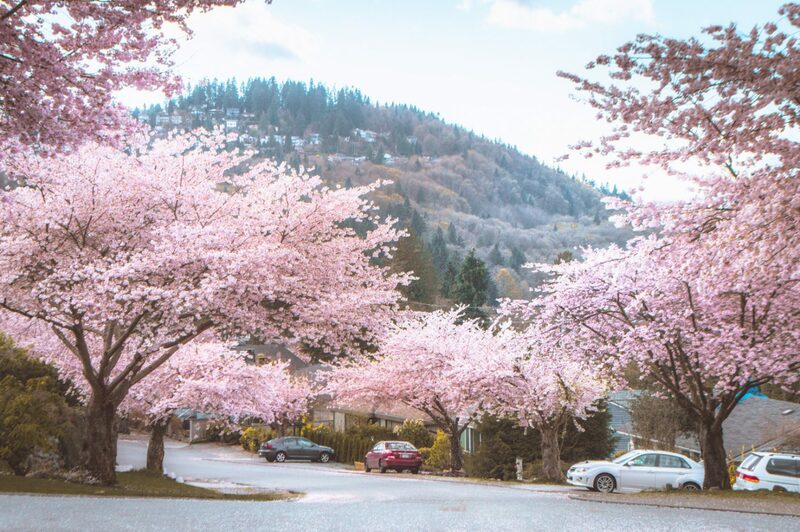 There’s tons of gorgeous cherry blossoms in Vancouver – I trust your Insta-senses will find them. 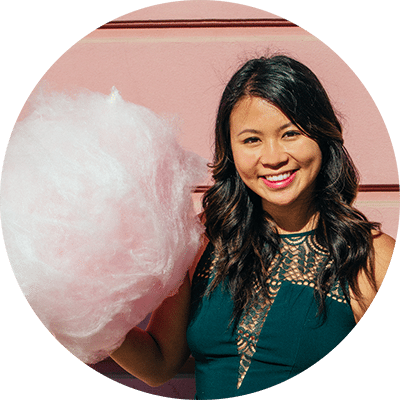 If you’re more of a Type A planner, the Vancouver Cherry Blossom Festival has put together an aggressively detailed map of all the best spots in the city (with details on which are currently in bloom). Click here to check it out! Wow, and here I thought the Cherry Blossoms in Seoul couldn’t be beaten. Why was Vancouver keeping such secrets from me? I can’t wait to see it for myself. Thanks for the guide! I am pretty sure that you got the most perfect photos ever of these blossoms! I was totally impressed and amazed with your shot when I saw it on IG today! Wow these are some amazing pictures. I really love the pink blooms on the trees! I had no idea Vancouver is this beautiful in the spring! Gosh what a surprise!! I’ll have to go one year! AMGGG I’m coming to Vancouver on Tuesday and I cannot WAIT to see these! That photo of Belcarra Drive is unreal. 😀 Charging both camera batteries as I type this, haha. Great tips and amazing spots! Oh my gosh Christina, your photos are all so pretty!! I’m disappointed I didn’t have time to prance around Vancouver taking photos of all the sakura when we were there last week! Our cherry blossom trees did bloom here in Victoria a few weeks ago so I did get some nice shots in over here, though 🙂 Will have to make sure I make it to Vancouver around this time next year! ps. I love that photo that your dad took of you! So cute!! Gosh, seems like you can see cherry blossoms everywhere but Hong Kong! ✨ I’ve always thought Japan was the only destination to go for the blossoms but seems like they’re everywhere in the world – even Vancouver. So beautiful! These are so stunning! I want to go now. I’m a Kelowna native and I’ve spent virtually no time in Vancouver! I really need to go! Wow, these are gorgeous! Especially the Belcarra Drive, definitely think that’s my favourite based on pics. 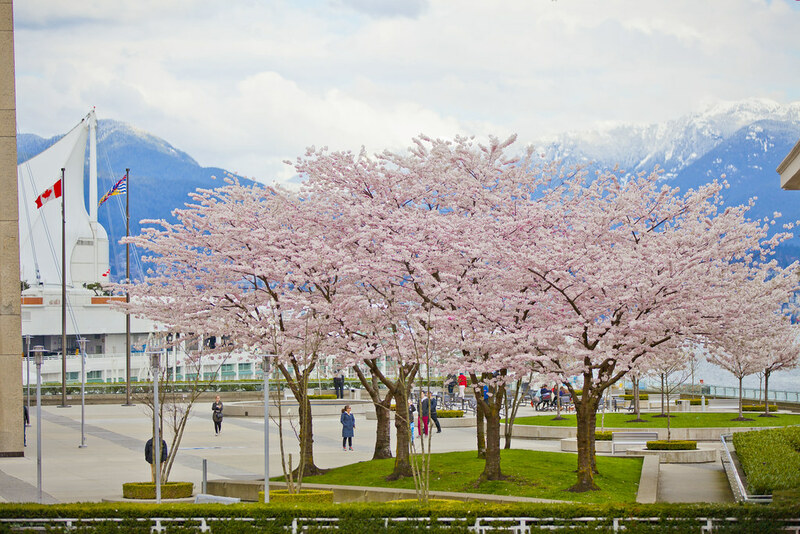 Also never imagined that Vancouver would be a good cherry blossom destination! You learn something new every day eh?